67 Not Out readers coincidence stories - many thanks to the contributors. My wife and our children were going on holiday to Pwllheli in Wales. As we were driving up the hill going out of Betws-y-Coed our car decided to break down. We stopped completely at the top of the hill. This happened a few years back before mobile phones were in general use. As we were stuck I tried to flag down other passing cars but none stopped to help. That is until a young couple in their late twenties finally came to our aid. I told them I was in the RAC (a car breakdown service) and wanted to get to a phone for help. The husband said that he thought there was a public phone in the village near the slate mines of Blaenau Ffestiniog. They kindly offered me a lift and said they would bring me back to my car after I'd made my call to the RAC. We found the phone, which had quite a bad line, so I had to speak quite loudly to give my name and the details of where my car was. When I'd finished making the call the wife of the couple said that she couldn't help but hear that my surname was McLoughlin and that this was also her maiden name. It turned out that her family and relatives came from the same part of Ireland where my parents still live. Even more of a coincidence, we found out later, was that we are distantly related. At the time the couple told us that it was a spur of a moment idea for them to decide to pay a visit to the slate mines, and that was how they had come to see us at the side of the road. The chances of this happening must be so remote. I thought that it was weird as though some unknown force had derived such a rescue. Since that time we have become very good friends with the other couple and still visit each other regularly. When I had finished setting up this post it was time to have something to eat in the evening. Feeling lazy we put the television on while eating - okay I know it's not a good habit! - and the programme we watched was Great British Railway Journeys. 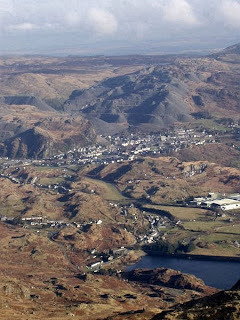 By coincidence the places they travelled to were Betws-y-Coed and Blaenau Ffestiniog as mentioned in the above story. They are not exactly places you hear very often on television. I am a teacher and one day I was explaining to my young students how a jury works in a court of law. I told the class that I had only once been chosen as a juror. When I arrived home that evening I found amongst my post a Jury Notice. I had been called on to do jury service a second time. I received the following sad little story after I published the post Where Is Heaven and thought it very apt. It was all very sad for Lucy as her pet gerbil died. She was in tears as I explained to her that Gerald would go to heaven. "Are you sure mummy? Will he be happy there?" she asked. I did my best to reassure her. I wrapped Gerald up in a large square of material and took him to the refuse bin outside. I know this may sound heartless but, living in a flat, I had nowhere to bury him. I again explained to Lucy that Gerald would be able to get to heaven from there. About 10 minutes later I felt a draft through the flat and noticed the front door was open. As Lucy is only four I panicked and rushed out to find her and there she was: sitting on an upturned bucket looking at the refuse bin. I asked her what she was doing. "I'm waiting to see Gerald go up to heaven," she replied tearfully. Great stories! That one about Gerald is particularly poignant. You always post such interesting stories!